So I am going to add my bit to the numerous blog posts and newspaper articles proliferating out there in response to the publication of designer Howard Slatkin’s new book, Fifth Avenue Style: A Designer’s New York Apartment, some 240 pages devoted to the finest details of one of the mostly finely conceptualized spaces I can remember. 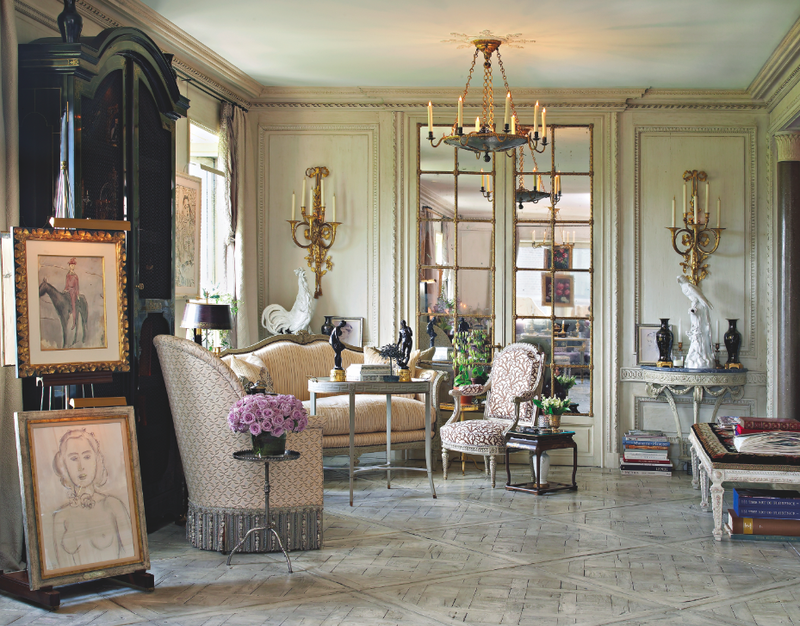 Beautifully photographed by Tria Giovan, the book explores Howard’s 6000 square foot Manhattan apartment – which is more reminiscent of an 18th century palazzo than a New York City home. Rather than say much more about it myself, I would send you over to read the many features that have cropped up in this past week since the launch, from Sara Ruffin Costello’s profile in T Magazine, with great additional photos by Simon Watson and a video tour to Mark D. Sikes, Little Augury and Quintessence‘s varied posts. While I have been following Howard on Instagram for quite some time now, my first experience with his apartment comes from a 1999 issue of House & Garden. I can remember poring over the issue, studying the exquisite details and promptly tearing it out for my files. The space was extraordinary and the idea that it was a current creation and not a restoration blew my mind. Usually my Then and Now posts are all about change but not so in this case. Perhaps when you spend three years building your masterpiece, you are loath to change even the small details. While the entryway shown above, with its antique French grisaille wallpaper panels is literally exactly the same now as in 1999, I did find a few small changes here and there elsewhere in the apartment. And it is always fun to explore differences in styling, placement and photography, so please excuse the damaged center folds and enjoy this trip down memory lane. While the 46 foot long living room – his “bowling alley” as Howard calls it – retains the same furniture, it has been rearranged. In 1999, the sofa with inset mink panel (yes I did just type that!) was set against the long wall with the tiger velvet armchairs on either side. Definitely click for details. Now the sofa and chairs sit in that far window, perpendicular to their previous placement. A canapé is now the back left corner of the room and that fabulous painted fauteuil with the brown and white upholstery has been moved there as well. You may even spot some other small details that have changed. But by far the most noticeable difference is in the style of the interior photography. The 1999 photos by Pieter Estersohn are all golden and streaming with sun, while the current ones are cooler and more about accurate color. I’m not a photographer, but it seems to me that this must be an extraordinarily challenging apartment to photograph. In 1999 digital images were not yet the norm, so I think you had to go for mood sometimes. Also, warmer colors were in style in 1999 and gray was not the rage as it is today. Perhaps highlighting that incredible gray glaze and finish on the Parquet de Versailles floors wasn’t as important. But trust me, people are going to be swooning about that floor! …and the divinely over-the-top Orientalist screening room, which I believe has had some changes. A current photo of this room shows quite a bit of tweaking in the art and accessories and substantial accumulation on the desk. If this was a different apartment, I might have said that was all there for photo styling purposes, but my instincts in this case are that it is permanent display. I think my favorite room by far has to be the guest room. According to the H&G article, it took 5 months for artists to paint additional wallpaper to match the 18th century Chinese originals, and 2 months to make the washi to paint it on. I think you’d have magical dreams sleeping in that bed. 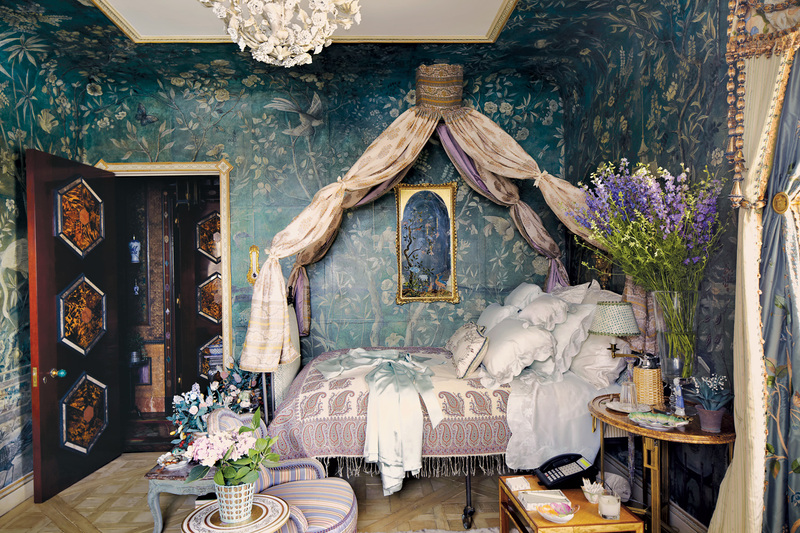 The dressing table corner highlights the layers and passementerie of the bedroom curtains and a few standout images in the wallpaper, like the birdcage. In a current photo, the bed is styled with a divine paisley coverlet. I’ve always loved paisleys but hadn’t given them much thought recently and now I have been hankering for one. Notice again the cooler light in the recent photo versus the warmer light in the older ones. But the real reason I kept the spread was the close-up photos. There was so much to study, so much to learn and be inspired from, even though I wasn’t possibly going to recreate any of it. Artisans in fields like these don’t really exist anymore – at least outside of Slatkin’s studio. In the book, he is very clear on giving his collaborators credit for their work, which I love. 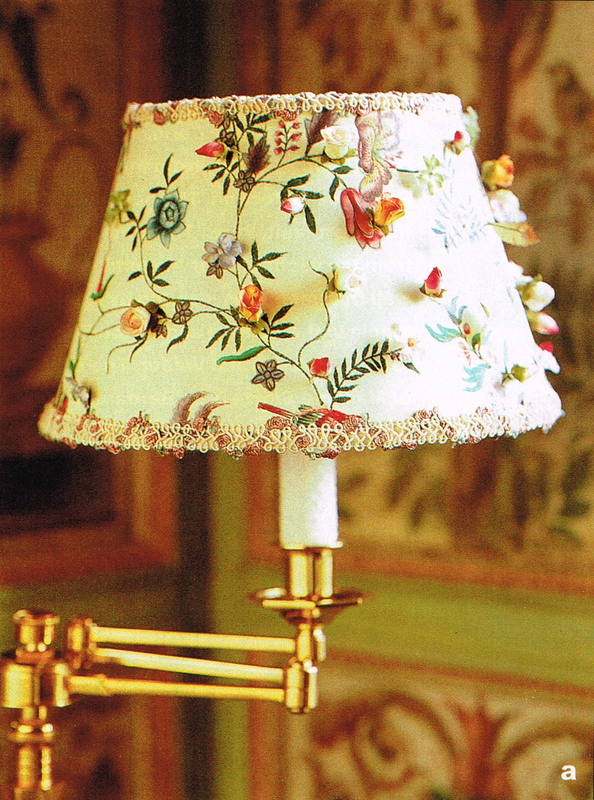 …and a lampshade made of 18th century Chinese silk adorned with hand painted silk flowers made by the artisans in Slatkin’s atelier. You know I live for a good patterned lampshade! Thinking about this apartment, having just come from Rome too, has set me to musing about the loss of fine craftsmanship in a modern world. It’s part of the reason why I always advise people to buy antique when they can. In Japan too, artisanal ways have become increasingly rare and economically unsustainable. I think the take away lesson from Howard is figure out what you love and support those who can help you make it look that way. You choose an object that you really love and everything else falls into place. 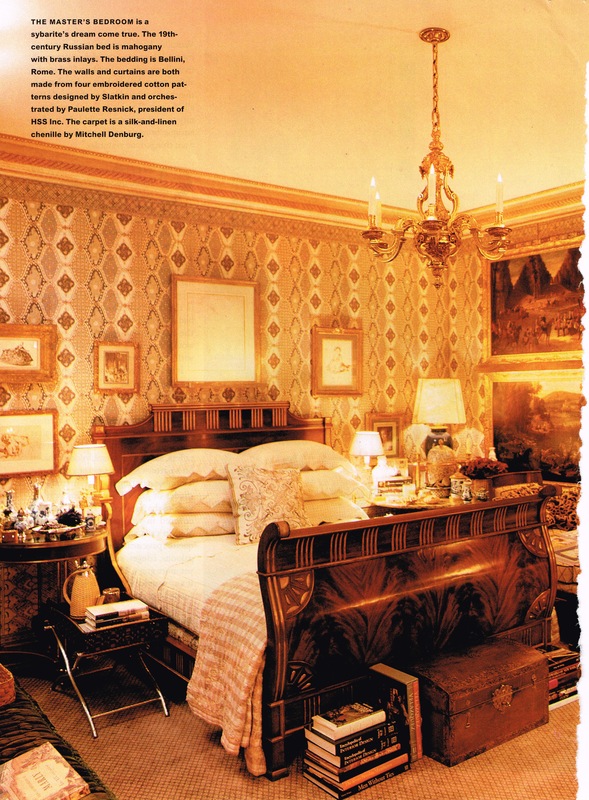 I knew there was another reason I had been hunting for this particular issue of Elle Decor from 1996 featuring Marjorie Wollan’s New York apartment. Back in the spring I had noticed it was for sale – but totally redecorated with only a vestige of the old furniture and design. It was so different I almost couldn’t believe it! What also made the difference stand out so strongly to me is that the real estate listing photos are so bad. Their goal is showing practical information such as square footage and layout and have absolutely no styling in comparison to the magazine shoots. So I am going to pull a mini-Joni and play a little decorator detective here. As you read, think about which way you prefer it – you’ll have no doubt of my opinions! So as I mentioned in that last post, this was one of the first “undecorated” decorated spaces that caught my eye and it influenced me tremendously. Wollan, who worked for the French perfume company Annick Goutal at the time, had such a Gallic flair that Goutal herself said “Whatever you want to do with my company, I trust you,” upon walking into the apartment. Nothing felt planned or stagey, it was just a group of beautiful objects, some precious, some less so, arranged for comfortable living. It didn’t hurt that the large two bedroom was surrounded by a wraparound terrace on all sides with gorgeous old-fashioned French doors everywhere either! The living room had great bookshelves with molding and sconces and well read looking books stacked and crowded in. Yes, the yellow is dated now, but was the height of fashion at the time. That being said, it was used as a neutral and not to create a particular color scheme, which was a very modern choice. 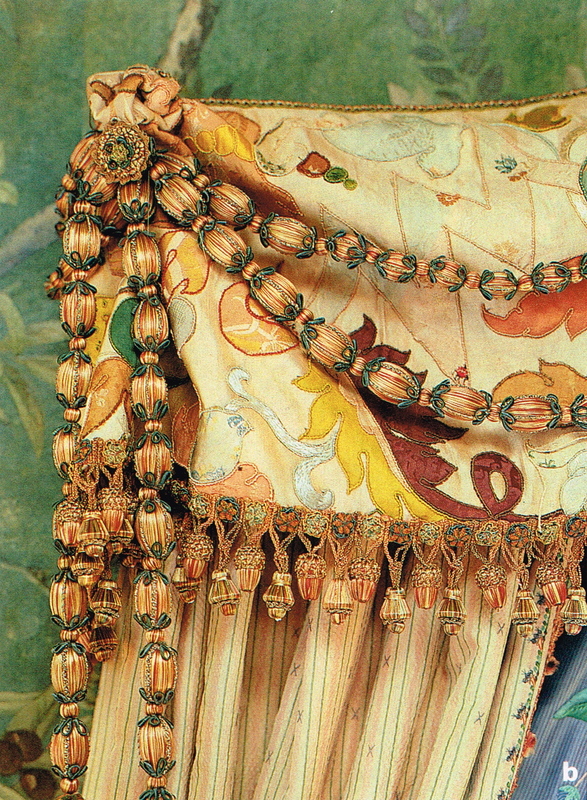 Click the photo for a larger detailed view – you can even see the cute tassels along the bottom of the settee. The close-up shots are much better. I think this might be the first of those marble-topped French bakers tables I love so. The giant clock and puddled draperies struck me as very European at the time. Here’s a better view of the ticking stripe Chesterfield – you’ll note Elle Decor reversed the image for the front cover. There is a full length mirror on the back wall with a crystal sconce overlayed on it. I love the worn leather cushion on the painted antique chair. The dining room was just dreamy with its polished pedestal table and unusual Thonet bentwood chairs – even the cushions and the bows – and that amazing trumeau mirror. Fancy but casual at the same time. I still love this dining room to pieces! The master bedroom had a wonderful exposed metal canopy bed, long before the Anthroplogie one was available to everybody. Painted Chinoiserie screen paired with an antique American quilt. Ruffled sconce shade against stripey wall covering. Loved the mix! 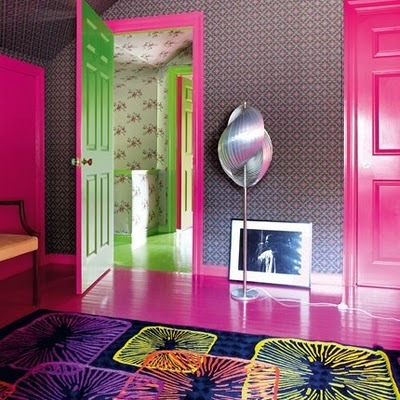 While boasting nothing significant, the guest room had a play of color and texture. The bathroom was all about this little shelf vignette – a perfect piece of jewelry. Brown and white aesthetic movement soap dish and toothbrush holder – all the details are there. And note the vintage style brass faucets which are the height of popularity now. Wollan was ahead of her time. A later tear sheet from a 1999 House & Garden lists Wollan as working at Guerlain and shows a later version of what I believe is the same bathroom. Look closely at the sink and fittings from the photo above and below – I think they are the same. But the bathroom has been redone with white marble lining the walls. 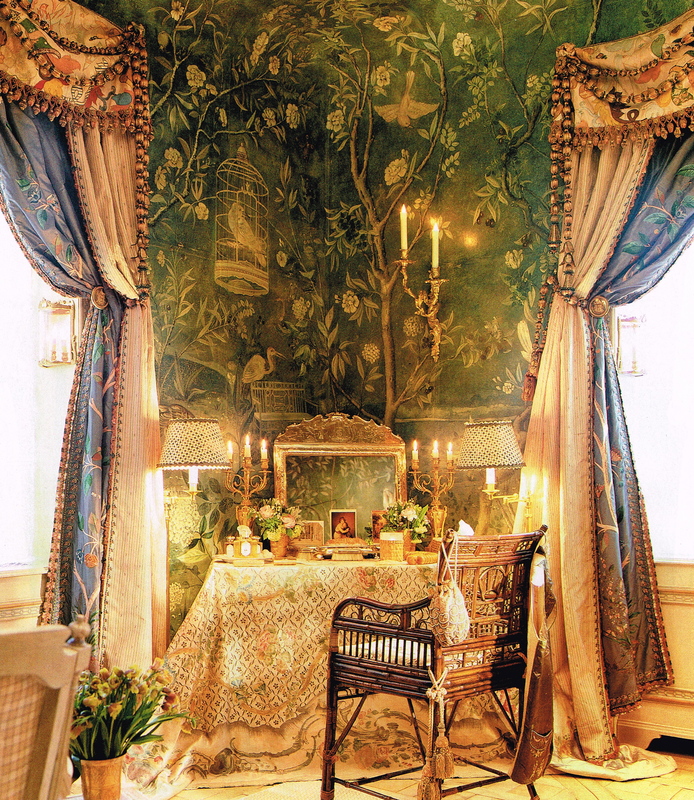 The jewelry effect has been kept with this Italian gilt mirror, exposed brass fittings and animal print chair. A similar vignette to the one in the earlier photos has been created on this vintage marble washstand. Just so pretty without appearing staged. 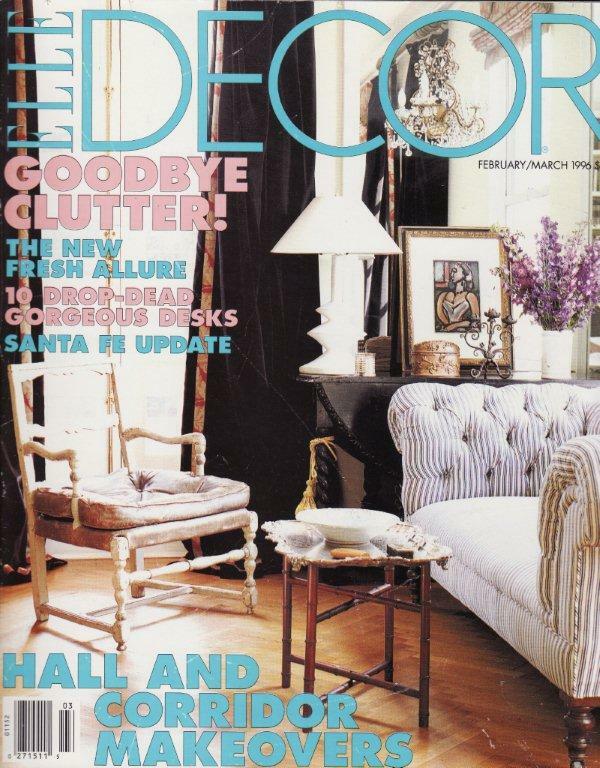 And now on to the February 2012 real estate listing – 16 years after the Elle Decor spread. The living room is structurally unchanged – the bookshelves remain and the apartment has been painted a very au courant grey. I do love this new color and with all the natural light from the many windows, I bet it works very well. The settee is gone from in front of the shelves and a flat screen TV lives there now. A leather-covered bergere sits where the bakers table used to, between the window and the french door. The Chesterfield is in the same place but has been recovered in a plain light blue fabric. Waaaah!!!! No more ticking! Looking the other way in the living room, the large mirrors remain but just about everything else has changed. Graphic Hicks-style rug, Mies van der Rohe Barcelona cocktail table, and an animal print stool mixed together are again very “undecorated” and eclectic but very different from the original version. It is all still trés chic! …found it here on the other side of the dining room now. This entryway photo gives a good sense of how the rooms relate to each other and a view of another modern icon piece, a Le Corbusier chair, added to the living room. I can’t tell which bedroom this is from the listing and it is the only one shown, but my suspicion is that it is the master. While charming, I think this newer version looks way more dated than the blue and white iron campaign bed version above. I do spy our old friend the giant clock from the living room hanging over the dresser. If you are as crazy as I am and want to see more photos, including the kitchen and terrace which were never featured in the original Elle Decor issue, check out the listing at House of the Day in The Wall Street Journal. And now dear readers, which way do you prefer Wollan’s apartment and why? Do you like these posts tracking the evolution of a space? Do you change your spaces often? And how? By rearranging gently? Adding over time? Or completely re-doing all at once? Do you follow interior trends or buy with an idea of ownership forever? The word Victorian has been rolling around my mind for months, but only partially because that is the official period in which our beach house was built. As an adjective, Victorian means buttoned up and prudish. For most people, when they hear it, they think of ornate embellished houses and furniture, but for me, the word has a different connotation, as seen from a design history perspective. After “trying on” many revivals – Medieval, Gothic, Rococo, Renaissance – in the early Victorian period, the opening of Japan in 1854 , the discoveries of archaeologists in Egypt and an interest in all things exotic and foreign created dramatic new styles in interior design. The Aesthetic Movement in the later part of the 19th century highlighted art in the production of furniture and design for the home, partially as a response against the Industrial Revolution. Maybe it is a stretch to make the comparison, but I feel that for the last decade or so, interior design has been traveling down this same path, only with a much paler and lighter color scheme. For a while, I assumed the desire to weave an eclectic mix of objects from different time periods and nations stood out to me because I was living abroad and doing just that. But the overt prevalence of it everywhere has turned it into its very own style, whether in a modern or traditional context. 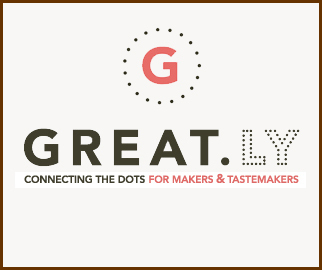 Simultaneously, the recent movement towards homemade and authentic goods comes as a similar response to our consumer culture and poor economy. While not wanting to be overly literal about this idea, the much written about December/January 2012 issue of House Beautiful (the title, by the way, of an influential lecture given by the touring Oscar Wilde in 1882) makes this same point and can be used to illustrate it perfectly. Joni over at Cote de Texas, did an interesting post last month comparing the home below, designed by Mark Sikes and Michael Griffin, with her own (and I thank her for the photos as the magazine is not making them available online), but I am going to use it for my own comparative purposes. The living room, well worth clicking on and enlarging, has influences from around the globe. Blue and white porcelain abounds, from Chinese garden stools to Japanese hibachi as planter, African Zebra skin, French style chairs and a massive gilt console.. The giant antique Chinese lacquer cabinet is the kind of universally useful piece I always recommended purchasing back when they could still be easily found in Hong Kong and China. On that note, you’ll be hearing more from me on Chinese antiques later this month when I do a special series for Chinese New Year week. 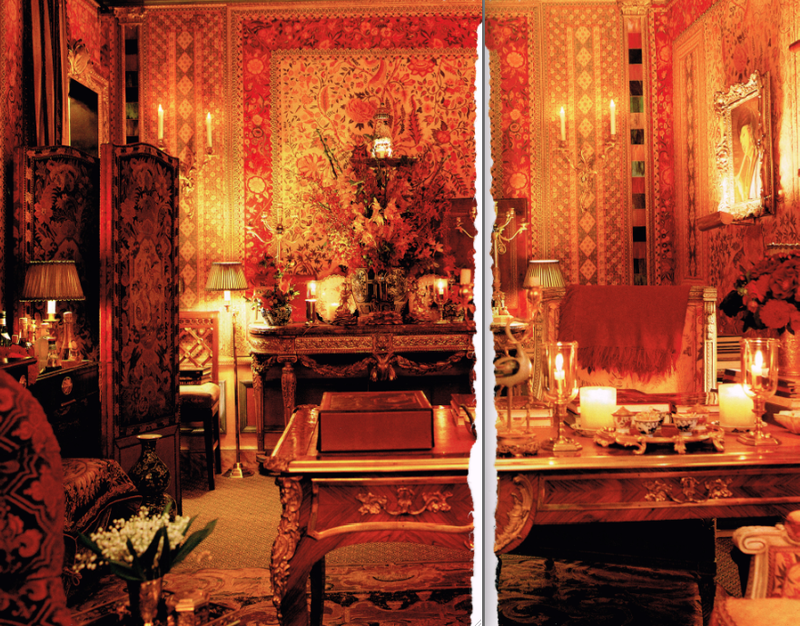 Just pages away is another spread, designed by Katie and Jason Maine, whose style proclaims them clearly Michael Smith alumnae, called “The New Global,” featuring an amazing English Japanned lacquer secretary from Therian, a piece that reads similarly to the Chinese cabinet above. Other worldwide influences include an English arts & crafts mantel, Oushak rug, and antique cloisonné lamps, and again, it is worth clicking the photo to see it in detail. Watch for an upcoming post on Japanned furniture too. 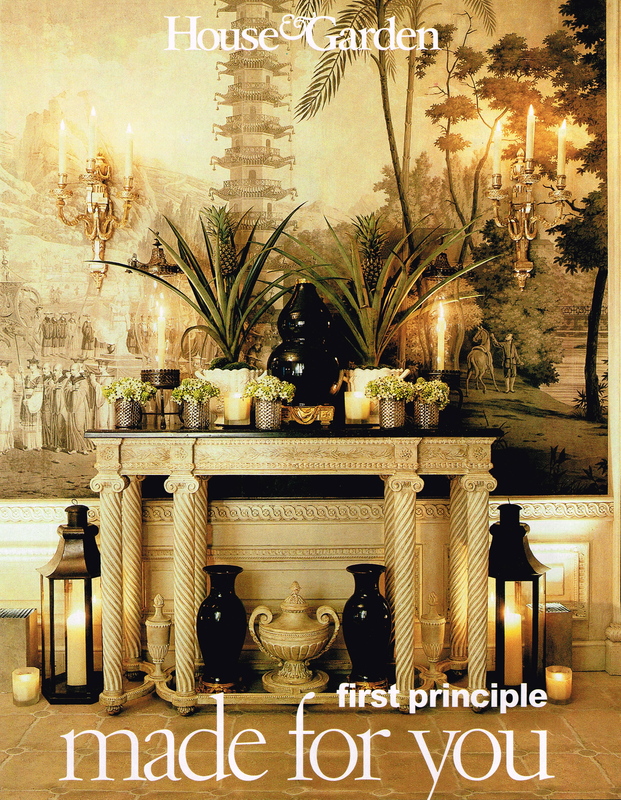 …the slightly more expected Gracie or de Gournay paper seen just pages before in the Sikes/Griffin home. But in either case, both rooms are an extraordinary mix and actually quite similar in their details – extravagant wall covering, Chinoiserie chairs, statement making chandelier. I have been following the work of the Iksels for a while, as they represent exactly the kind of cross-cultural trend I am talking about. The living room from their Paris apartment is almost a literal version of a Victorian space, only lighter and softer in color. And I have always loved this tented bedroom from the apartment, and shown it before here. Modern design is not left out of the equation either in this project from by Pamela Shamshiri of Commune Design. While using a different set of diverse objects and styles, the mix is still there. It kind of cracked me up that the magazine has full on re-discovered the Japanese aesthetic of wabi-sabi, the beauty of things imperfect, impermanent, and incomplete, although in their desire to throw the term around (they use it at least three times) I am still not sure they truly understand the meaning. The house has the “weathered, organic” feeling they describe, but every detail is utterly and absolutely perfect. For some authentic local wabi-sabi, look back here. That said, the house is beautiful and there is as much going on in this dining room as those above. For local folks, I’ll be tracking down some modern icons like the Wegner Wishbone chairs above in an upcoming “Shop Talk” post on the mid-century modern antiques and furniture available along Meguri-dori. Again, the warm rugs, kilim pillows and other global textiles are the perfect counterpoint to all the wood. For the full article with more photos, click here. Interestingly enough, this house is shown as being a 2008 project in their portfolio, making it not that new…And as for not that new, I am sure I saw the February issue already on the news stand as I ran through the airport two days ago. For me personally, this global aesthetic runs rampant through my Tokyo home and is definitely starting to appear in the beach house. I only had a few days in New Jersey over winter break, but managed to move a few projects along and here are a few sneak peaks. Our bedroom is shaping up – remember how I said there isn’t a photo spread without a suzani? We are using a long narrow one as a window valence. …but a bargain vintage find, sent off to be reupholstered will go from hideous yellow moire to lovely linen floral (draped for example in the photo). 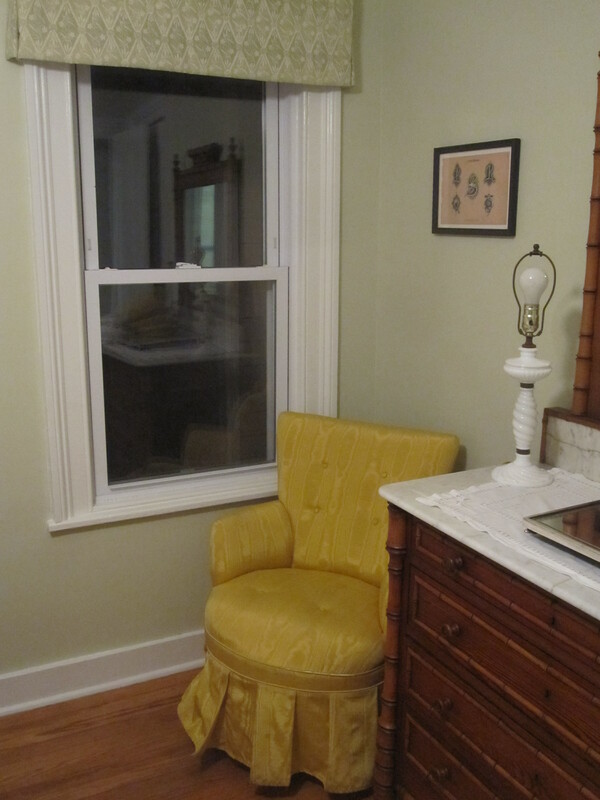 Guest room chair checked off my list! Downstairs there is a little Belgian meets Scandinavian meets English floral prettiness going on, but it is temporary, as my Bunny Williams OKL purchase is slated for the kitchen. I wish I had more to report on from the house, but three days right before Christmas is not a lot of time…More details on these rooms soon! Image credits: 1. via Brooklyn Muesum, 1,4, & 7. 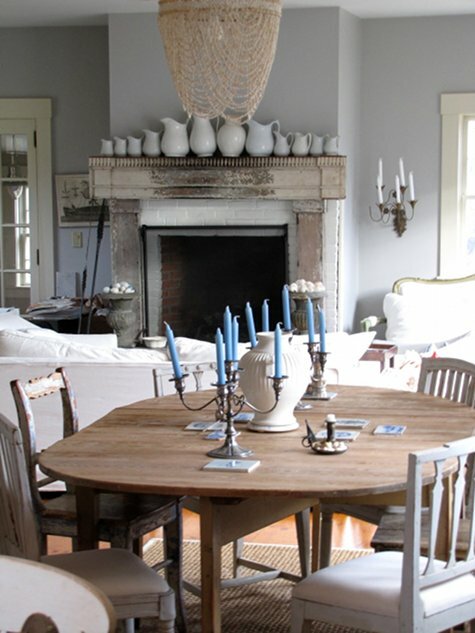 House Beautiful December/January 2012, photo credit: Amy Neusinger, via Cote de Texas, 2-3, &8. House Beautiful December/January 2012, photo credit: Victoria Pearson, 5. 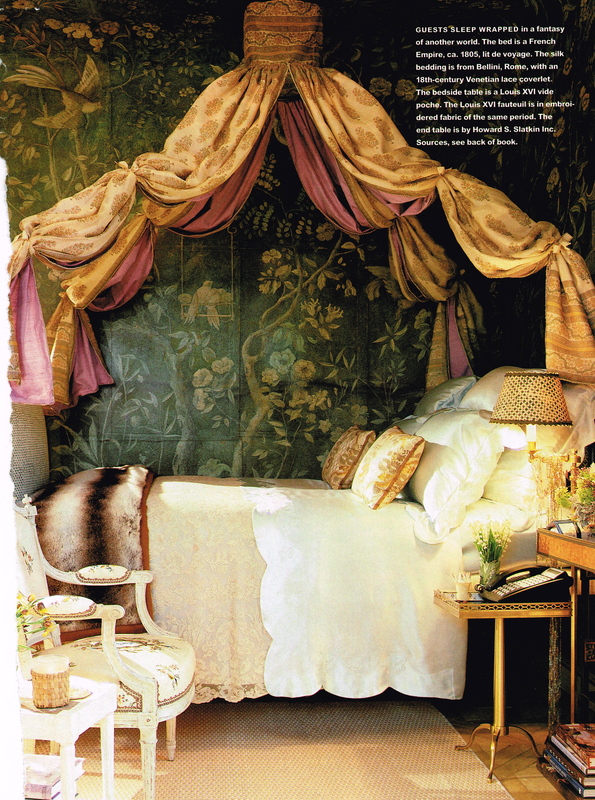 Elle Decor December 2006, photo credit: Simon Upton, 6. Domino February 2008, photo credit: unknown, 9-13. House Beautiful December/January 2012, photo credit: Amy Neusinger, 16-18. me. Their earliest kitchen out in the Hamptons that I know of is this one, and it begins my tale of obsession. The wideplanked floorboards, dark cabinets with white marble counter, the open shelves laden with simple white shapes and of course, this French pastry table used as an island. I can’t figure out the date or what magazine published the spread, but it was early 90s and dear to my heart. I am not sure that I have ever moved on from this kitchen, and if you think about the kitchens we see all the time today that are constantly blogged about – Sally Wheat’s, the kitchen in Something’s Gotta Give – they all have their roots here. As I now have a late 19th century kitchen that desperately needs remodeling, I have a chance to take some lessons from the Wolfman-Golds and put them to work. Starting work on my kitchen continues to rest on finding the perfect island. The double sink (so they can cook together) is another signature Wolfman Gold detail that we see here. This is one of the earliest views of a front apron sink that I can recall too. And don’t the ironstone pitchers remind you of this more recent photo I have shown a few times on the blog? You can see the bracket and beadboard detail over in the corner by the stove. Fast forward to 2008 and Elle Decor featured yet a new house built for the Wolfman-Golds, designed in collaboration with Jack Ceglic, a collection of modern white corrugated-steel jewels. Here the country look has melded with industrial – Peri and Charles have most definitely moved on, even if I wasn’t ready for them to. The kitchen island is basically a larger stainless steel version of the marble-topped island from the previous homes, albeit with more storage. But what I really want to know is where has that other table gone? No answers are to be found in the accompanying article. Her beloved ironstone pitchers still line open shelves – that much has not changed. And again, even with all the more modern stainless steel, the overall feeling of simplicity remains. And if you look closely at the terrace, the mismatched French iron chairs have made it over from their earlier home. I just want to sit here all day drinking copious amounts of iced tea. I share another love with Peri Wolfman – galvanized tin containers (and hydrangeas) – only she has soooo much more storage space for them! Going back in time, we switch to the kitchen in her Greene Street loft in Soho, an apartment I believe she and Gold have lived in for almost 20 years. This photo comes from a New York Times article about how a building developed right next to them made them lose some windows in their apartment, including one over the double sinks. Instead of pouting forever, they ran the beadboard over the space where the window had been and extended their display shelves. It looks so amazing, you would never even believe a window had been there. More goodies here include another French baking table (although without a marble top) and some kind of shop counter making up the other side of the kitchen. The copper pots are worth drooling over and I love the vintage screen door on the pantry. I am pretty sure the cover of their 1999 book A Place for Everything is shot through that pantry door. Again fast forward, this time to winter 2011. Here too, I believe she may have moved on although I am not perfectly sure. In this recent Oprah Magazine article from this past winter on this master of organization and storage, Wolfman seems to be in a newly designed kitchen which they refer to as being in her apartment. Now I don’t believe they moved, so they must have remodeled. Clean, sleek and white and more contemporary than its previous incarnation, her signature orderly display of everyday objects is still the key component. Dishes are neatly stacked in the pantry. Wooden cooking utensils make a glorious and simple bouquet. So it just goes to show that in the Wolfman-Good world, the more things change, the more they also stay the same. But what I would really like to know is where that marble-topped bakers table in the older Hamptons houses lives today!!! What makes this post so apropos right now is that Peri visited Tokyo this past weekend and we hung out!!!!! (Lots of exclamation points necessary) On Sunday we ravaged the Oedo Antique Fair together, shopping till we almost dropped and I got answers to many of my questions. Tune in to my next post to see what Peri bought and hear more about her philosophy. I love that feeling of a ship being blown by the wind. 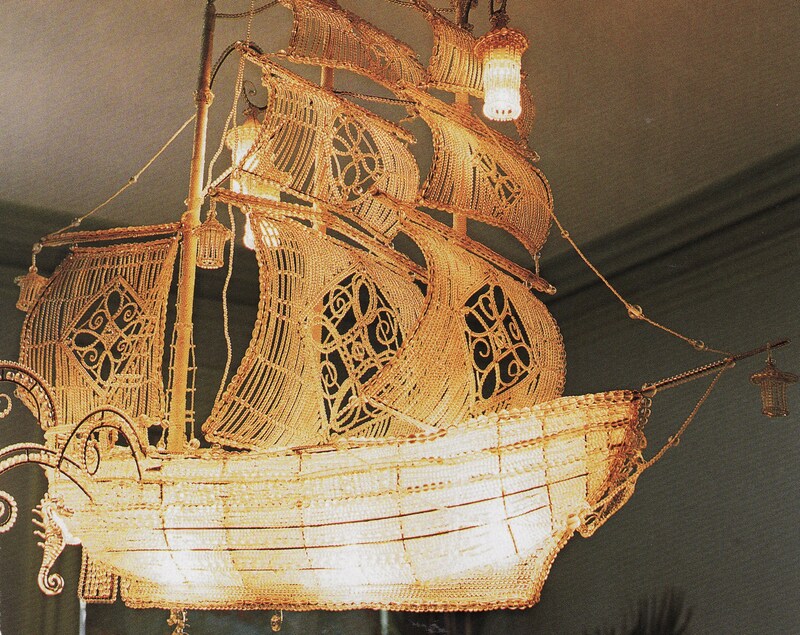 The chandelier wouldn’t be nearly as pretty if the sails were flat. 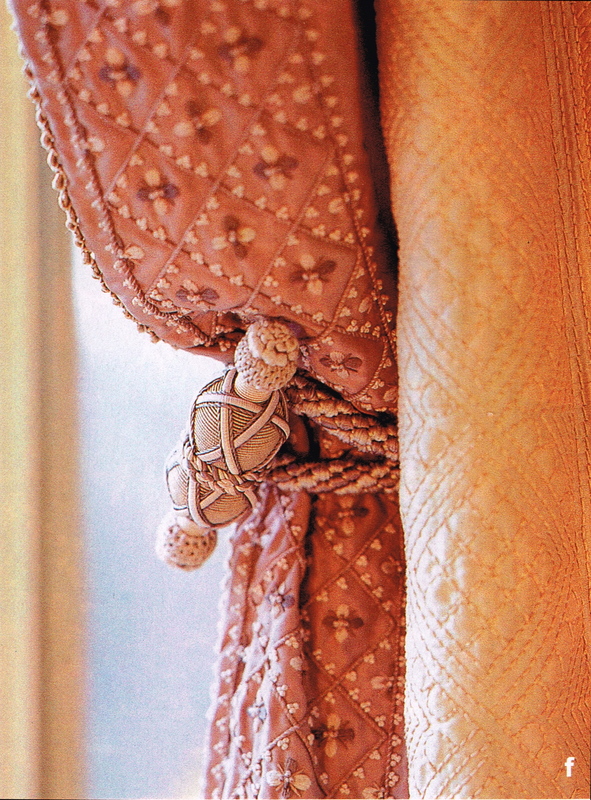 Brandolini’s kaboom moment for me and many others was the amazing set of double height patchwork curtains showcased in the January 1998 Vogue. Her command of color and textile was evident at this early date, although many of her trademark pieces are not yet evident. The next space of hers to really catch my eye was the Manhattan townhouse apartment she designed for Molly and Hugh Burns. In their space we start to see many of the early and ongoing signature Brandolini touches such as fabric covered walls in bold ethnic prints, interesting flat-woven rugs (this one by Allegra Hicks), and stylized tufted seating in the round. 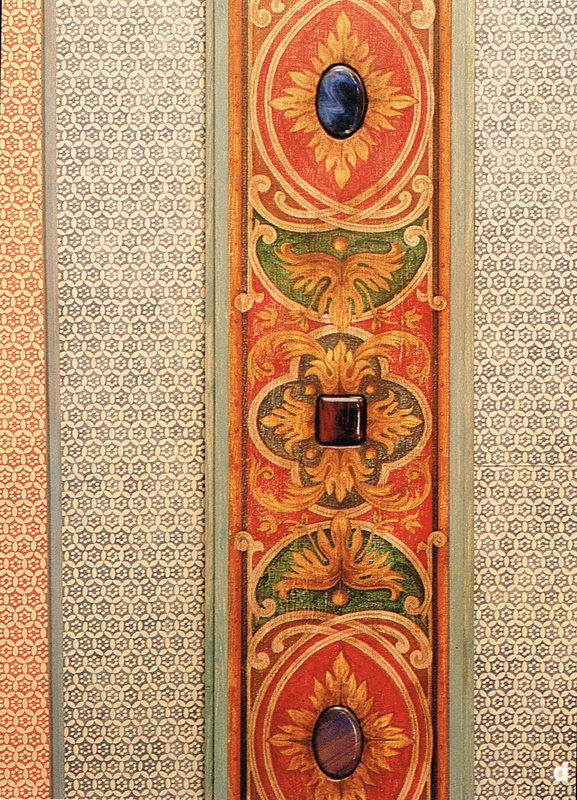 Brandolini has a gorgeous line of textiles, rich with color and pattern, one of which was used to cover the walls. The central living room boasts a turquoise portière (door curtain) and a pair of her trademark slipper chairs, upholstered in 18th century Japanese ikat, French tapestry and silk. I don’t think there is a Brandolini interior without one of these chairs! 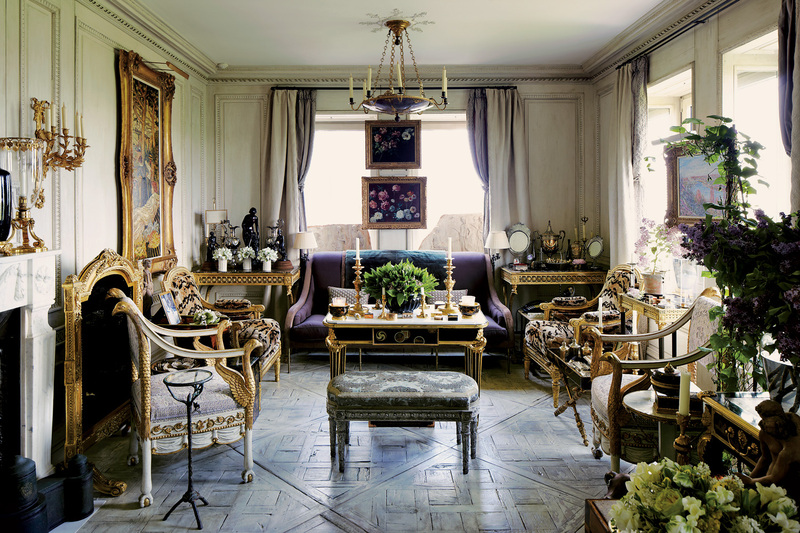 And the Madeleine Castaing cocktail table is another piece found often in her early rooms – “You either like it or you don’t. I love it, ” Brandolini has said. I agree! One of the best features in the bedroom started out as a mistake. Rather than try to make the tiny cramped space seem bigger, she cozied it up with grasscloth on the walls and ceiling. Unfortunately, the seams didn’t lay flat, so she added strips of embroidered ribbon to cover them, creating a grid. 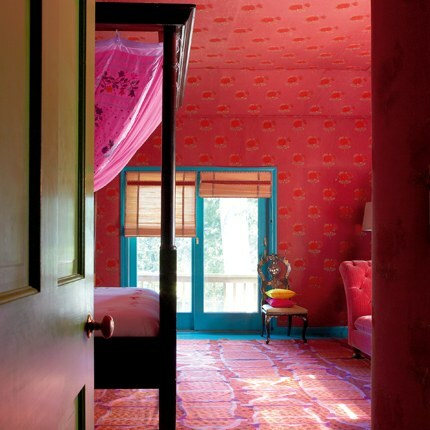 The bright silk pillows and suzani pick up the colors in the detail of the ribbons, making this room feel like a tiny jewel box. …and the patchwork slipper chair covered in antique textiles. One corner of the living room features a 19th century Japanese low table with floor cushions. 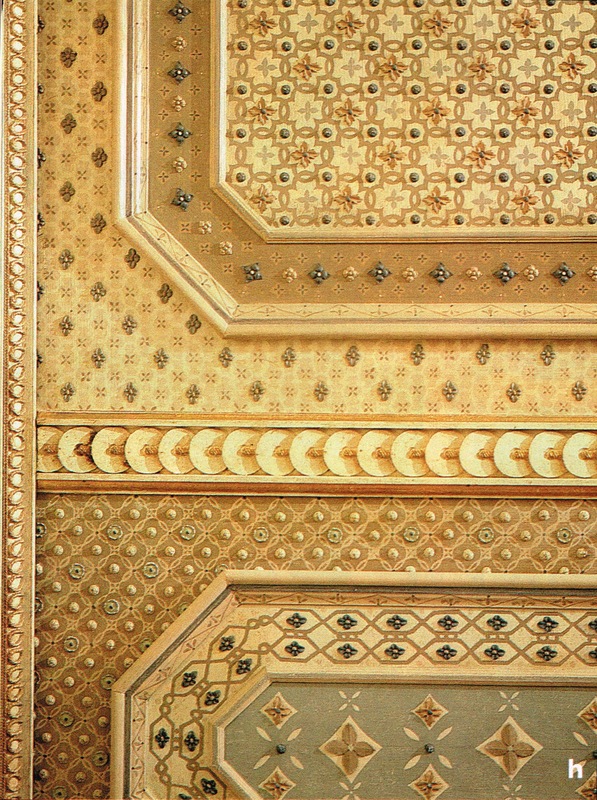 The library has a unique wall treatment – cut velvet upholstery panels – which read like fretwork doors. A 19th century Chinese daybed piled with cushions made of global antique textiles provides a comfy spot to curl up. In contrast, a modern turquoise desk and orange upholstered flea market chairs anchor the other corner. This entire room is full of unusual choices. For an Upper East Side apartment, Brandolini combined graceful sudare blinds with a modern adaptation of a Japanese screen. Another trademark, pierced fretwork tables, are seen here too, along with a flatweave rug and interesting throw pillows. An earlier version of this room had lucite coffee tables and different throw pillows. Which do you prefer? And in this amazing Chelsea dining room, designed for Ava and Henry Pincus, a modern mural painted on stylized sliding doors (fusuma) gives the room a real Japanese vibe. I find this room eminently functional but oh so charming. Brandolini can also handle very contemporary spaces, as in the media room designed for Sean and Leslie Goodrich which showcases modern artwork (including a piece by Jenny Holzer), that perforated table and throw pillows made of Japanese fabric. But it is in Brandolini’s own townhouse which she redesigns on a regular basis that I think we see her real genius at work. By changing paint colors and furniture placement, adding and subtracting, but fundamentally re-using so many of her things, she transforms the space completely each time she redecorates. 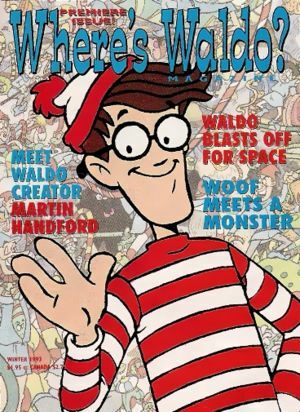 My kids have long loved the “Where’s Waldo” books, perfect for entertainment on plane flights or train rides. 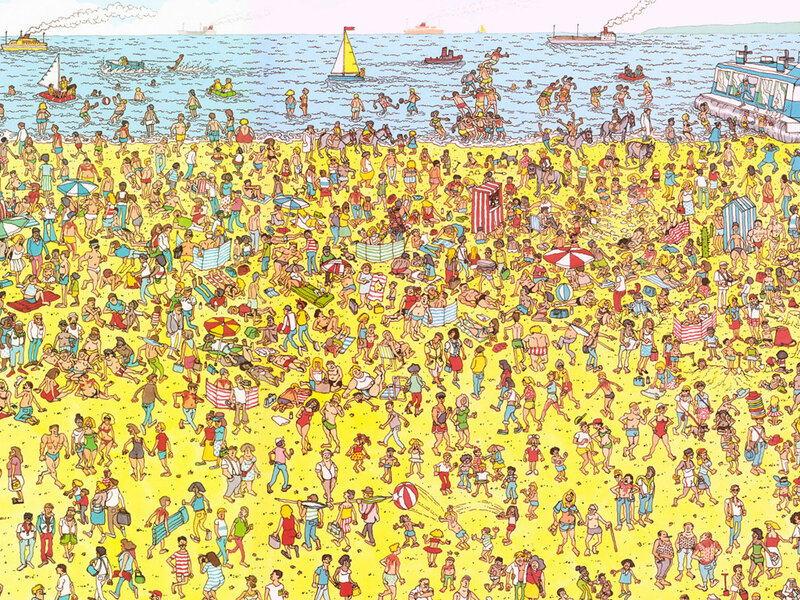 If you have never seen one, a character in a striped red and white shirt is hidden among hundreds of other small people and the goal is to spot him on each page. As you look through Brandolini’s incarnations of her home, play it with yourself. Pick an object and see where you find it next. I have ordered the photos by room, having a version from 1997, again in 2006 and finally the newest version just published in the March 2011 issue of Architectural Digest. In some cases the perspectives line up perfectly, but in others they don’t, so it may take some imagination to sort it out. 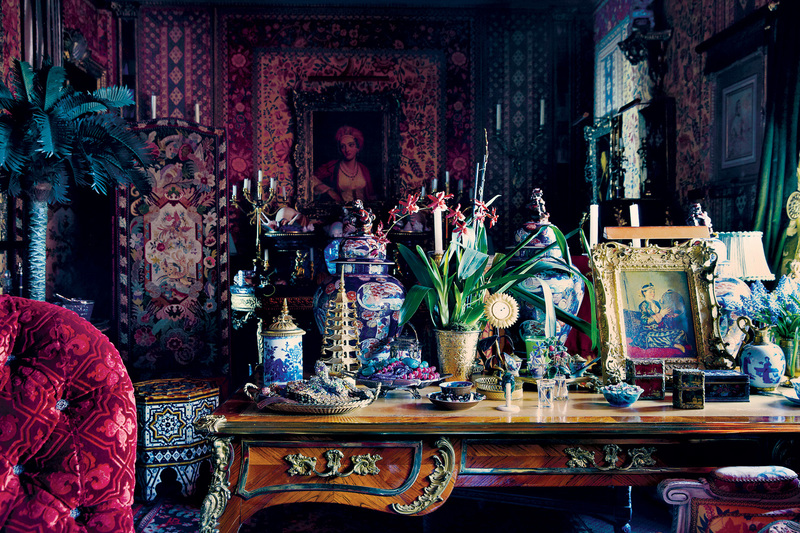 In the earliest version I have, Brandolini’s living room is painted blue with green trim and she uses a similar Allegra Hicks rug and Madeleine Castaing table as in the Burns apartment and the slipper chairs covered in antique fabric. She has not yet discovered sudare and has soft Roman blinds at the windows. A huge painting by George Condor hangs over the sofa. The show-stopper of the room is the extraordinary crystal and jade galleon ship chandelier made by Claire Cromier Fauvel. She also loves to use Venetian half shades on her lamps. 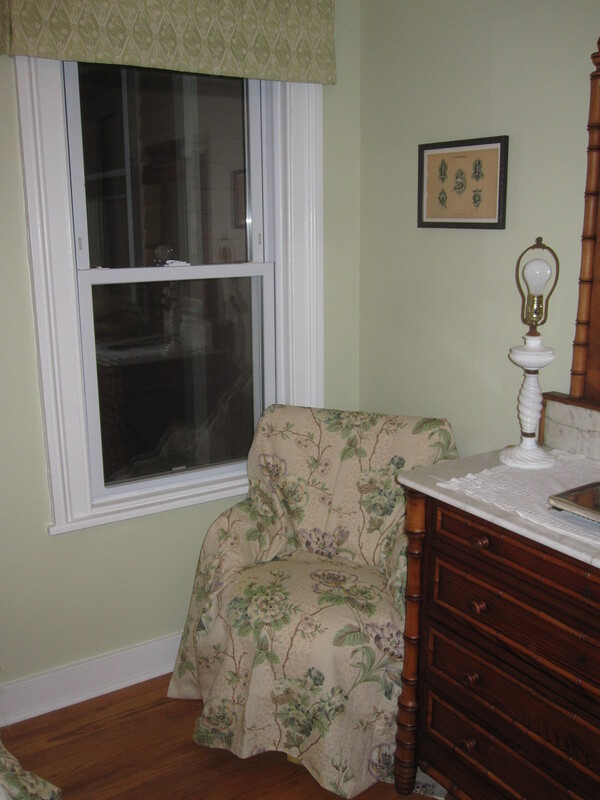 Brownstone rooms can be very narrow, so they are a great space-saving device, as well as a design statement. In the most recent incarnation of the room (2011), the palette has been toned down, the original Condo painting returned to its position, yet a different sofa moved under it, and the armchairs activated into the seating plan. The sudare and Smarties table remain. She has changed the rug to yet another design by Tondato. Imagine my despair at seeing the crystal ship chandelier gone (replaced by a Dutch modernist fixture by Gerrit Rietveld) but do not panic yet. 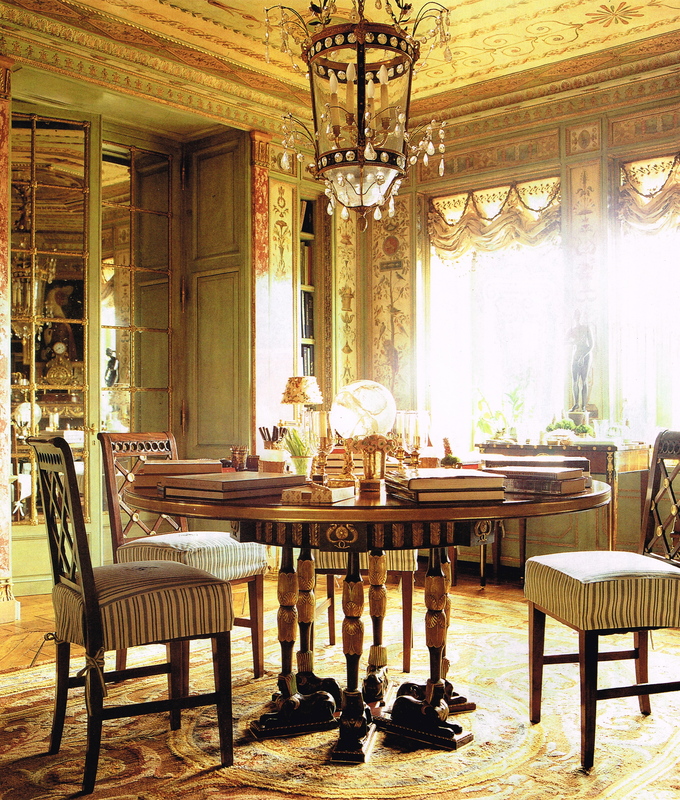 Brandolini’s dining rooms have undergone some of the most dramatic transformations. One of her unique choice is to place a daybed in the dining room for reclining after eating. 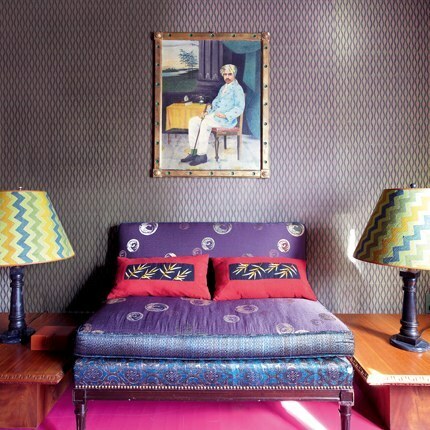 This photo shows Brandolini in her circa 1997 dining room on a red lacquer Chinese daybed, with walls covered in a fuchsia Indian block-print of her design. Maybe we should be playing “Where’s Nuno” with the 1956 portrait of her husband Nuno hanging behind her (hint- we have just seen it relocated to the 2011 living room). By 2006 the dining room was completely changed. There was still a daybed to recline on, but this one is 19th century French. Vintage fabrics from Turkey, Japan and China have been made into pillows and hand-embroidered Vietnamese silk lines the walls. The Fortuny sconces are still there though. I didn’t show a photo of the Louis XV inspired antique chairs in the earlier version of the dining room, but I believe she was using them then, and continues to do so. While the 2011 version is paler in color, it is no less exuberant. Again Brandolini uses fabric on the walls, this time a white corduroy, beaded in Vietnam with her favorite Ernest Hemingway quote. I wonder if she still has a daybed in the dining room? Like some of her earlier work shown above, the 1997 study has portières, these made of a Chinese silk. The room is painted the opposite colors of the living room, green walls with blue trim and I feel fairly sure that the window does not yet have her trademark sudare blinds. Her 2006 study was wildly popular in the blogosphere. The richly saturated color and the neoclassical banquettes covered in a mix of Japanese, French and Indian textiles were actively admired. The Chinese rug has been traded for another one of Tondato’s designs, sudare added and the chandelier changed as well. 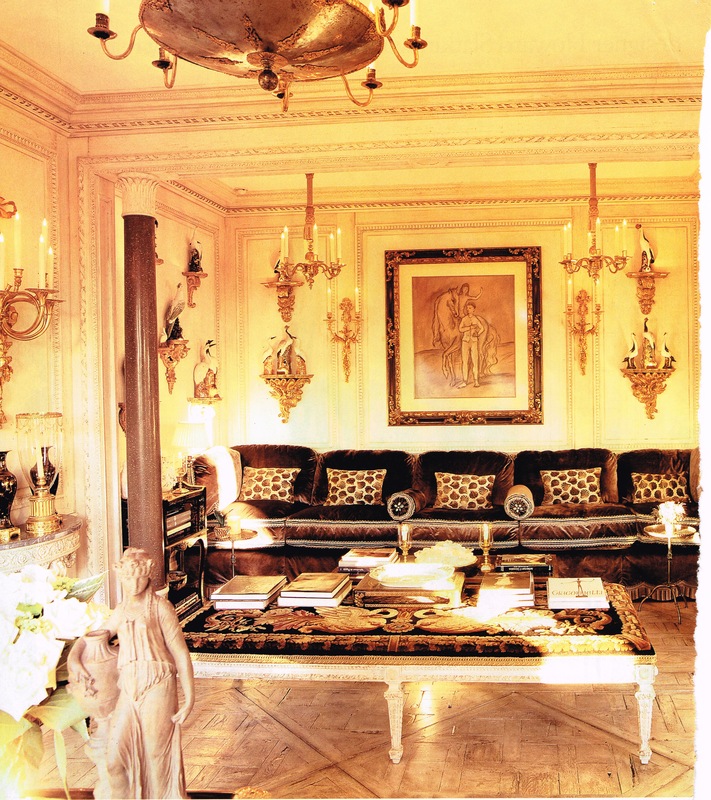 In fact, I think I remember this chandelier from an earlier version of her bedroom, pictured in the ’98 Vogue. I don’t have a view of her kitchen earlier than 2006. Here the 1940’s Jean Dunand marble table is the showpiece along with the Ingo Maurer designed light fixture. In the 2011 kitchen, not that much has changed. The 1940s marble table hasn’t moved – I figure it is too heavy! The bentwood chairs have been traded out, as has the light fixture and new cabinets commissioned from furniture maker Jonah Zuckerman. Unfortunately, I don’t have earlier views of the bedrooms either. In 2006, Brandolini’s master bedroom has another rug designed by Fedora designs and a bed upholstered in 18th century French brocade. The wall covering remains the same in 2011 but she has added an ornate Portuguese bed and changed much of the artwork. The guest room doesn’t change that much either. The patchwork grasscloth on the walls, the vintage silk saris lining the ceiling and Donald Baechler print are found in both. This 2006 version has a wrought iron bed. Another view of this room, including a very familiar chair can be seen here. Her guest room in 2011. The wrought iron bed is gone but do you remember where you last saw this lamp? I’d love to hear your comments on which version you like best, as well as the items you spot moved around. And I can’t possibly show as many photos as I would like so I really recommend taking a look at her portfolio on her website, as there are projects there I have not shown. 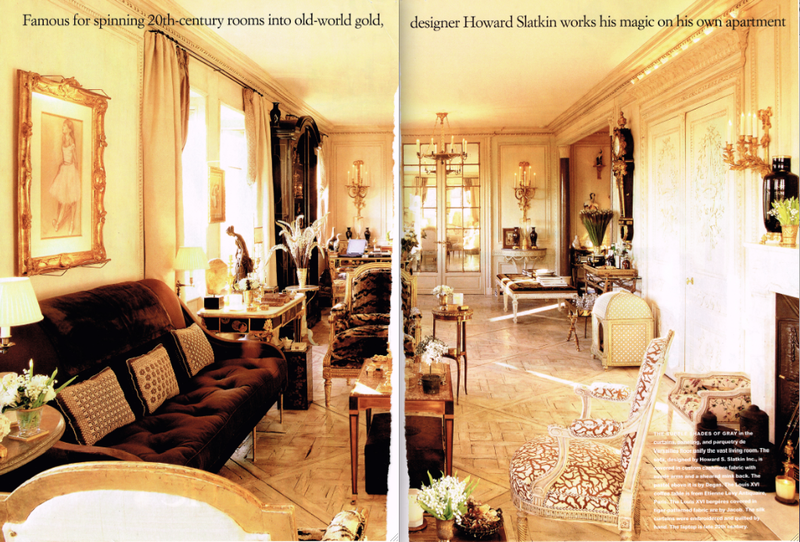 More photos of the 2006 version of her apartment and the Goodrich apartment can be found at Elle Decor. And how is the newly revamped Architectural Digest with former Elle Decor Editor-In-Chief Margaret Russell at the helm you may ask? This first issue is looking good, frankly, looking a lot like Elle Decor…More on that changeover can be found in a recent article in The New York Times. For more background on sudare, see On the Blind’s Side…Sudare and Curtains. Image credits: Patchwork curtain photo from Vogue January 1998, image credit: Eric Bowman, Burns apartment from Elle Decor February 2001, photo credit: Fernando Bengoechea, Upper East Side apartment and Pincus Chelsea dining room from Muriel Brandolini’s website, Goodrich media room from Elle Decor January October 2009, 1997 Muriel Bandolini townhouse photos from House & Garden October 1997, image credit: François Halard, 2006 townhouse photos from Elle Decor January 2006, photo credit: Pieter Estersohn, 2011 townhouse photos from Architectural Digest March 2011, photo credit: Pieter Estersohn.